WESTERN GASKET AND PACKING CO.
MICRO VU Q-16, METROLOGY COMPARATOR WITH DRO, MODEL V-2000, S/N 1356. BENCHMASTER 4 TON OBI PUNCH PRESS. 5) V&O NO. 2 AND NO. 3 OBI 2O AND 30 TON PUNCH PRESSES. NIAGARA A35, 35 TON OBI PUNCH PRESS, 3’’ STROKE. NIAGARA A2, 18 TON OBI PUNCH PRESS, 12.75’’ STROKE. NIAGARA 35 TON, 3’’ STROKE PUNCH PRESS. CLEARING 30 TON OBI PUNCH PRESS. JOHNSON 22 TON OBI PUNCH PRESS. BLISS NO. 19C, 18 TON OBI PUNCH PRESS, 2’’ STROKE. BLISS NO. 21 ½ OBI PUNCH PRESS. DIAMOND NO. 31 OBI PUNCH PRESS. DIAMOND MODEL 3048, 30 TON X 48’’ MULTI MAX PUNCH PRESS. LARGE SELECTION OF UN COILERS AND COIL HANDLING EQUIPMENT. AMADA MODEL M-2545, 98’’ X 3/16’’ MECHANICAL POWER SHEAR W/ POWER BACK GAGE. DIAMOND MODEL 1072, 6FT X 10 GA POWER SHEAR, WITH SQUARING ARM AND SUPPORT. PEXTO CIRCLE SHEAR MODEL 299L, 20 GA CAPACITY. 2) RICHARDS MULTI FORM BENDERS. BURR KING MODEL 760 SANDER. BRIDGEPORT VERTICAL MILL, J HEAD STYLE. DO ALL 16-2, VERTICAL BAND SAW WITH WELDER. ABRASIVE NO. 3 SURFACE GRINDER. REID NO. 2A, 6 X 18 SURFACE GRINDER. ENCO 1540, 15 X 40 ENGINE LATHE, With 5C COLLET CLOSER. 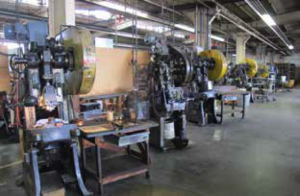 CLAUSING 13 X 36 LATHE. LARGE SELECTION OF INSPECTION TOOLS, AND TOOLING. DRILL PRESSES, GRINDERS, AND SANDERS. IR 15 HP AIR COMPRESSOR.